In 1869 Egypt opened the Suez Canal, after ten years of works, becoming unexpectedly, and all of a sudden, a major player in the international scene. Ismail Pasha, the uncontested ruler of that country, desired his country to undergo key changes so as to match the grandeur of France, an ambition certainly stimulated by the success of this engineering marvel. He commissioned many large and luxurious buildings, and among them a large opera house with seating capability of over 1000, the Khedivial Opera House, which was inaugurated with a performance of Rigoletto on November 1st of that year. But just as it has happened in other historical instances, (van Westerhout’s Doña Flor, for example, was commissioned by the Mola Township for a performance in the Civic Theater, subsequently named after the composer) his ambition was to have an opera specially composed for this theater. It had to be something magnificent and based on the country’s history; he envisioned an opera with customes and sets thoroughly reflecting Egypt’s rich history. The Egyptian ruler wanted not only his Khedivial Opera House to be one of the most renowned in the world; it wanted it to become the keystone of that country’s recently founded musical tradition. No one is sure from whom or from where the outline of the plot came, although it was gossiped that the author Temistocle Solera, who had previously written five librettos for Verdi, was the author of the original storyline, but having a basic story in his hands, the Khedive approached Auguste Mariette, a French scholar, archaeologist and Egyptologist, and the designer of the rebuilt Egyptian Museum, and asked him to supervise the sets and the customes of the future opera to make sure they would be as authentic as possible. No money would be spared to find the best composer, story and designers. Giuseppe Verdi was the Khedive’s first choice and he wanted to make sure that the great composer would be enticed with a clearly spectacular scenario, so that he would not refuse. Mariette accordingly asked his friend Camille Du Locle, librettist of Verdi’s Don Carlos and director of the Théâtre de l’Opéra-Comique in Paris, to write the libretto based on the preexisting narrative and contact Verdi. Du Locle had been attempting to get Verdi to compose an opera for his theater for a long while, proposing plot after plot, to no avail. 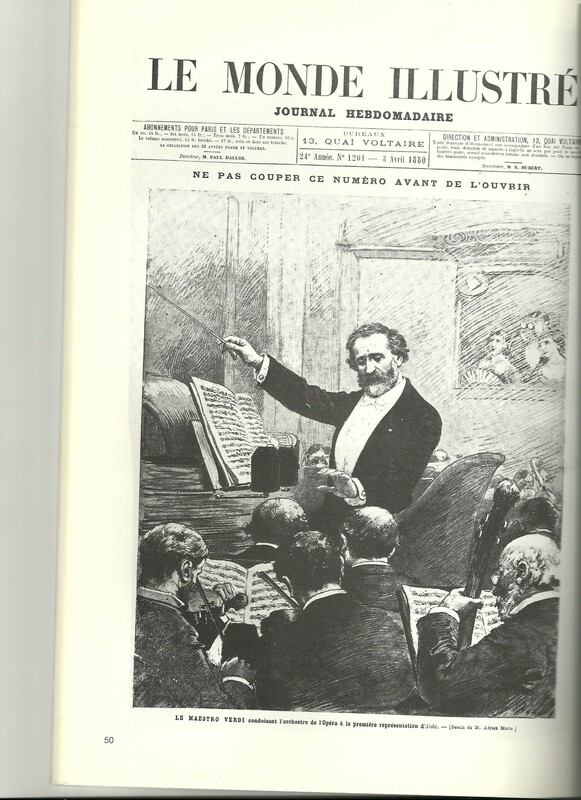 He figured that maybe this would be the opportunity to have Verdi compose an opera that could be played in Cairo, and after that in Paris, so he sent to Verdi the outline of the Egyptian plot on May 1870: it was an immediate success. The Italian composer wrote to him: “I have read the Egyptian outline. It is very well done; it offers a splendid mise en scène, and there are two or three situations which, if not new, are certainly very beautiful. But who did it? There is a very expert hand in it, one accustomed to writing and one who knows the theater well. Now let’s hear the financial conditions from Egypt and we shall decide”. Without even waiting for a proposal from Du Locle, Verdi sent him a second letter with his conditions, to be forwarded to the Khedive. In it, he asked that the libretto be written by Antonio Ghislanzoni, an Italian journalist, poet and novelist who had previously worked with Verdi on a revision of La forza de destino. He also proposed that he would pay and supervise the writer himself. Ismail Pasha accepted; his only requirement was that the opera would be ready by the end of January 1871. Verdi initially decided not to compose an overture for the opera, but simply a brief orchestral prelude. Later on, he changed his mind and wrote an overture of the “potpourri” variety to substitute the original prelude. In a final revision, Verdi deleted completely the overture because he felt it was bursting with “pretentious insipidity”; this overture, therefore, was never played in the Aida performances (the original Aida overture was broadcasted by Arturo Toscanini and the NBC Symphony Orchestra on March 30, 1940, although it was never made commercially available). The Italian composer kept his part of the deal and prepared the score by the date, but unfortunately something else occurred that made it the performance impossible. Auguste Mariette had gone to Paris in July of 1870 to supervise the building of the sets and the making of the costumes, but he had encountered unforeseen difficulties in creating authentic-looking customes. 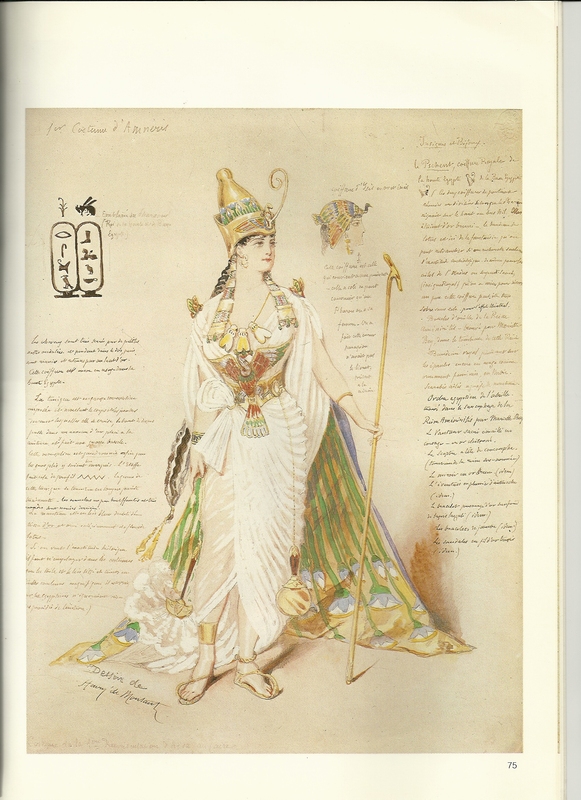 In a letter to the superintendant of the Cairo Opera, he laments: “[…] To create imaginary Egyptians as they are usually seen in the theater is not difficult, and if nothing else were needed, I would not be involved. But to unite in proper measure the ancient costumes in the temples and the requirements of the modern stage constitutes a delicate task […}”. If that was not enough, the Franco-Prussian war made it impossible to have any communications between that city and the rest of the world until May 1871, making the project’s anticipated date unattainable. That said, the extra time allowance would have given the opportunity to Mariette to obtain a final product that was as close as possible to his directions. While the Theatre de l’Opéra’s painters Auguste Rubé and Philippe Chaperon painted the scenes of the 2nd and 4th acts, and Edouard Despléchin and Jean-Baptiste Lavastre painted the scenes for the 1st and 3rd acts, Mariette oversaw the designs and the construction of the sets. 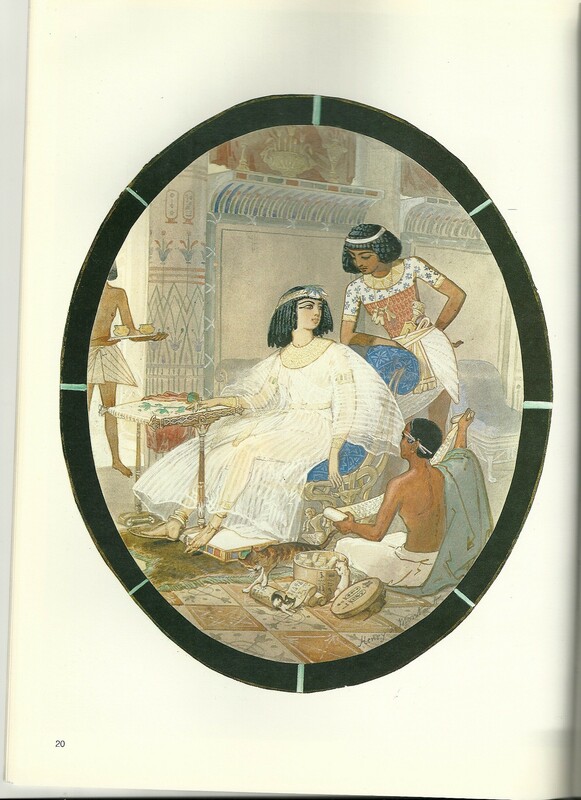 The famed Egyptologist also followed the preparation of the costumes. They were based on his original ideas, but the sketches were by Henry de Montaut, a designer, engraver and illustrator (he illustrated Jules Verne’s Voyages Extraordinaires). This brought another problem in the arena, which Mariette did not catch it until after the first performance: Montaut’s designing flair made him accentuate the spectacular side of the characters, and as a result the costumes turned out to be luxurious but lost in the process some of the authenticity Mariette had attempted to achieve. The critic Filippo Filippi called their opulence “really absurd”. 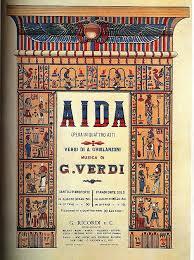 Regardless of all these impediments, Aida, the final magnificent work of Verdi’s second period, was performed for the first time in Cairo on the 24th December of 1871, conducted by Giovanni Bottesini and staged by Carlo D’Ormerville. A couple of months later, the European première took place at the renowned theater La Scala, in Milan. Although the Cairo performance was technically the world première, it is said that Verdi himself considered the Italian one, in which he was deeply involved at every level, as the “real” première, been displeased with the fact that no members of the general public were present at the Cairo première (the premiere was by invitation only). Moreover, Verdi had written the role of Aida for his close friend, the soprano Teresa Stolz, who could not perform at the Cairo première (the role of Aida was played by Antoinetta Anastasi-Pozzoni), but did perform at the Milan première. From the Teatro alla Scala to Paris it would have been just a small step, but somehow it was a big one, because it was in Paris that Verdi directed his own opera, a unique experience both for him and the spectators. From that point Aida went on to conquer the world as the undisputed queen of the big-spectacle operas. Aida uses all the elements of his art: awe-inspiring choruses and moving arias, dance, and breath-taking show and sets, sanctioning his standing as one of the greatest musical dramatists and making this opera one of the most played ever. The subject of Aida is doomed love and it is certainly something that has not lost its appeal, even in today’s world.